No-cook chocolate pudding using avocados for the creamy base. Puree avocados, cacao power, honey, and vanilla in a food processor until smooth. Sprinkle pudding with salt before serving. Melt the coconut oil in a soup or stock pot, then add the ground chilies and stir for 1-2 minutes until fragrant. Add the chicken stock, galangal, lemon grass, kaffir leaves, fish sauce, and chicken and simmer for 10 minutes until the chicken is cooked through. Add the mushrooms, lime juice, coconut sugar, tomatoes and simmer for another 5 minutes until the vegetables are tender but not mushy. Serve with fresh cilantro and scallions. Health of the community relies on the support of local businesses, so check out some of the amazing local restaurants in town, many of which rely on local farms for their food! Peterborough is incredibly lucky in that we are surrounded by organic farms! Rain or Shine, come and enjoy some of the best food, music and shopping Peterborough has to offer. What do you wish you knew before starting cancer treatment? Healthline Editorial Team asked several people who are living with cancer to tell them what they wish someone had told them before they started to receive treatment. Find the original article here. Are you living with cancer? 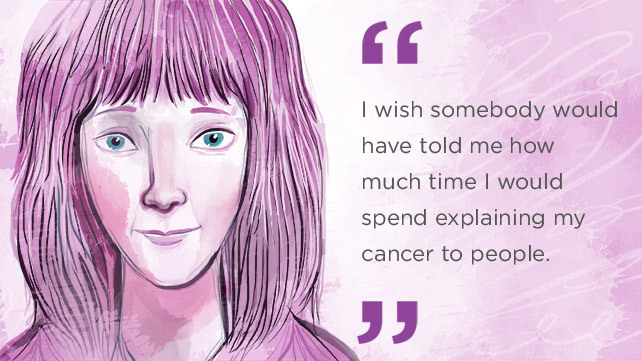 What’s one thing you wish someone had told you when you were diagnosed?